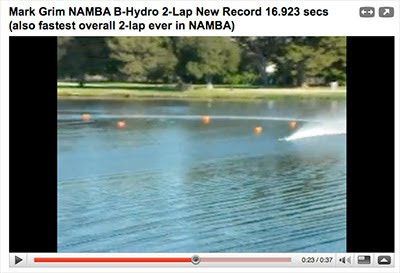 Mark Grim set a new NAMBA B-Hydro 2-lap oval record recently at the Lake Legg pond outside LA in California. The new record is 16.923 seconds and the boat had exit speeds of about 77 MPH (123+ KPH) out of the corners and about 90 MPH (144+ KPH) at the end of the straights! It's a Crapshooter 45 with a CMB 45 motor modified by Mark, a Truespin prop by Chris Grim and a Mark Grim turn-fin.